Would you like to whiten your teeth? If you, you’re not alone: teeth whitening is one of the most in-demand cosmetic dentistry procedures. It’s a competitively-priced way to improve your smile, look younger, and feel more confident when you interact with people in business or social settings. Meet with us for a consultation first. There are several different teeth whitening systems and a consultation will help you ascertain which procedure is best for you. 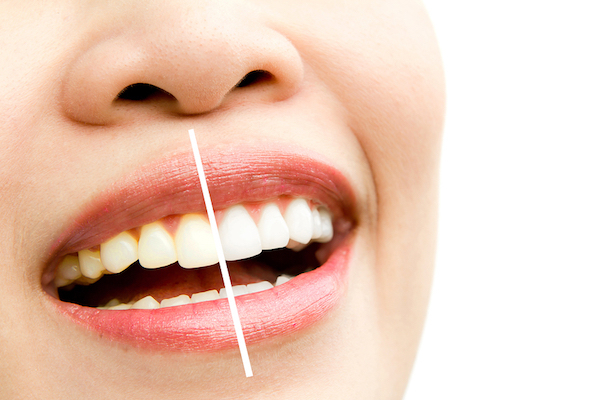 It is essential to know that whitening does not affect existing fillings, veneers, or crowns. During your consultation, decide how many shades lighter you want your teeth to be at the end of the treatment. Depending on the whitening technique chosen, your teeth can be whitened three to eight shades. We offer our patients in-office and take-home options from Sinsational Smile®. With any of the teeth whitening systems, tooth sensitivity may transpire. In most cases, it won’t last for more than a day or so. Call Jordan Landing Smiles – David B. Powell DDS if it lasts longer. Professional teeth whitening is just one of the cosmetic dentistry procedures available at Jordan Landing Smiles. Schedule an appointment with us today.